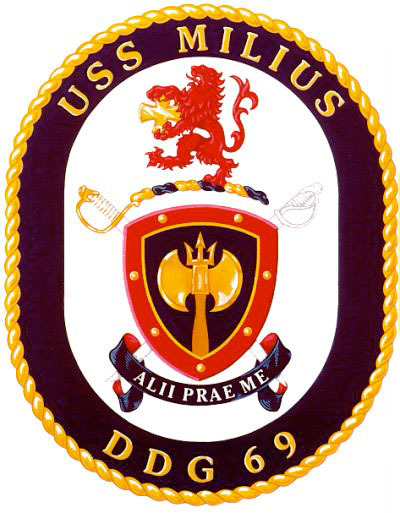 DDG 69 is named in honor of the Navy pilot Captain Paul L. Milius. He was born 11 February, 1928, the youngest of four children, in Denver, Iowa, a small, rural community in Bremer County in the northeastern part of the state. He and the fifteen other members of the senior class graduated from Readlyn High School in May of 1946. In April of 1946, just weeks before graduation, Captain Milius received his selective service notification and reported to his pre-induction physical examination at the local examining board on the second floor of the Waverly Savings Bank building in Waverly, Iowa. By 21 May of that year, the eighteen year old son of C. H. and Christina Milius was in "boot camp" at the Naval Training Center in San Diego, California, serving on active duty in the United States Navy. Captain Milius was discharged from active duty in March of 1948. His enlisted naval experience in the aviation community had only enhanced his lifelong intrigue with aircraft and his desire to fly. Knowing the route to the cockpit begins with a college degree, he enrolled in Iowa State Teacher's College, now the University of Northern Iowa, in Cedar Falls. Captain Milius continued to serve in the Naval Reserve throughout his time in college. In 1950, after attaining a two year degree, he applied for and was accepted into the Naval Aviation Cadet (NAVCAD) Program. In August 1950, he was back on active duty at the Naval Air Station, Pensacola, Florida, attending the U.S. Naval School, Pre-Flight course. He successfully completed this course on 16 December 1950 and was sent to advanced training at the Naval Air Station in Corpus Christi, Texas. On 16 December 1951, Aviation Cadet Milius was awarded the naval aviator's wings of gold. On 21 December, he accepted the appointment and took the oath of office as an Ensign in the United States Naval Reserve with the naval aviator's designator of 1325. On 30 December, he married his high school sweetheart (and class valedictorian), Darlene Meyerhoff. Captain Milius' early duty assignments as a naval aviator trained him in the Airborne Early Warning community. He spent the first three years of his career, from 1952 through 1955, attached to Airborne Early Squadron TWO (VW-2) at Naval Air Station, Patuxent River, Maryland, where he gained extensive experience flying the multi-engine Lockheed Constellation (WV-1) aircraft. He was subsequently posted to the Naval Air Station at Hutchinson, Kansas, where he served as a flight instructor for the P-2V patrol aircraft until 1957. His daughter, Annette, and son, David, were born during these years. Following two years as a student at the General Line School in Monterey, California, then Lieutenant Milius was assigned to Air Anti-Submarine Squadron TWENTY-THREE in San Francisco flying the S-2 aircraft. He served briefly with Air Anti-Submarine Squadron TWENTY-FIVE in Long Beach, California, before he was reassigned to ship's company onboard the aircraft carrier USS KEARSARGE (CVS-33). There he served in a variety of duties including Catapult and Arresting Gear Officer from November 1960 through November 1962. While onboard KEARSARGE, Captain Milius participated in the mission to retrieve Walter Schirra's Mercury "Sigma 7" space capsule in 1962 and made two Western Pacific deployments. In 1962, now Lieutenant Commander Milius was assigned to Naval Air Station, Miramar, California, where he served with Air Anti-Submarine Squadron FORTY-ONE (VS-41), filling a variety of squadron billets specifically related to anti-submarine warfare and S-2 aircraft tactics. Following an assignment as Airborne ASW training officer at the Fleet Air Electronic Training Unit Pacific, in Alameda, California, then Commander Milius volunteered for duty in the newly established Observation Squadron SIXTY SEVEN (VO-67). The new unit utilized converted P-2V aircraft, now known as the OP-2E, heavily armored and fitted with advanced land detection systems, for ground reconnaissance missions. The squadron deployed to Khon Phnom Airport in Thailand in 1967 and immediately began flying surveillance missions in the vicinity of the Ho Chi Min Trail. At 1157 local time on February 27, 1968, Commander Milius and the crew of his OP-2E aircraft were on an operational surveillance mission over Laos when the aircraft was hit in the radar well by a large explosive projectile, presumed a 37MM anti-aircraft fire. One crew member was mortally wounded by the initial blast and fire broke out in the aircraft. As it became clear that the aircraft could not be saved, Captain Milius took the controls from the pilot, Lieutenant Bernie Walsh, and gave the crew the order to bail out. Captain Milius continued to control the aircraft to enable his crew to escape. Of eight surviving crew members of the initial blast, all but Captain Milius were safely rescued on the ground by the 37th Air Rescue Recovery Squadron Jolly Green Giants. Although Captain Milius was seen exiting the burning aircraft, heavy enemy fire in that area led to search efforts being discontinued before he could be recovered. He was subsequently declared Missing In Action in Southeast Asia in 1968. Captain Milius' status was changed to Presumed Killed In Action ten years later. He was posthumously awarded the Navy Cross in 1978. Warship MILIUS's motto, Alii Prae Me, or “Others Before Myself,” was chosen to reflect the personal ethic held throughout Captain Milius' military career and his selfless act under fire. August 23, 1993: Construction of DDG 69 begins. 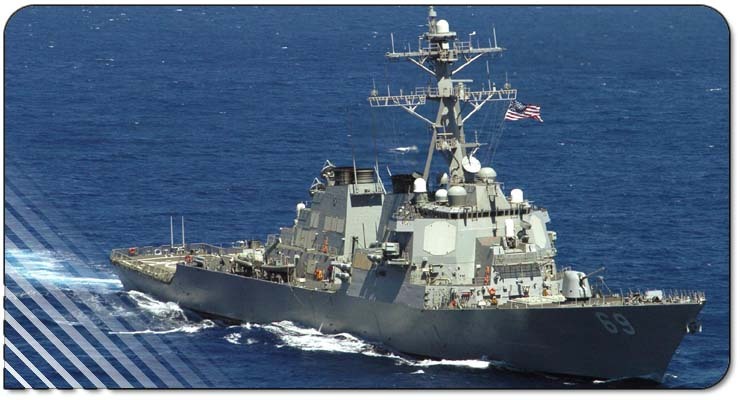 August 8, 1994: DDG 69's keel is laid at the Ingalls Shipbuilding site in Pascagoula, Mississippi. August 1, 1995: The drydock is ballasted down and the ship moved to her post-launch outfitting berth. October 28, 1995: MILIUS is christened by Ann Milius, CDR Paul Milius' daughter. November 23, 1996: USS MILIUS is commissioned with CDR Daine Eisold as her first Commanding Officer. November 25, 1996: USS MILIUS leaves Pascagoula, enroute to San Diego. November 27-30, 1996: Port visit in Cozamel, Mexico. December 10-15, 1996: After transiting the Panama Canal, port visit in Acapulco, Mexico. December 16, 1996: USS MILIUS arrives at her homeport of San Diego, California. March, 1997: During Post Delivery Tests and Trials in the Pacific, MILIUS visits the islands of Maui and Oahu. May 6-10, 1997: MILIUS pulls into San Francisco, California for her first stateside port visit. September, 1997: MILIUS completes her Post Shakedown Availability at South West Marine in San Diego and begins the Tactical Training Cycle. January 20, 1998: MILIUS completes the Tactical Training Cycle by successfully finishing the Cruise Missile Qualified Team trainer. February 27, 1998: CDR Jim McManamon relieves CDR Eisold as the ship's second Commanding Officer. May 26, 1998: MILIUS leaves San Diego on her maiden deployment. June 1, 1998: Brief port visit to Pearl Harbor, Hawaii. June 10, 1998: Brief port visit to Guam. June 18-23, 1998: Port visit to Singapore. June 24-28 1998: Port visit to Phuket, Thailand. July 8, 1998: MILIUS enters the Arabian Gulf. July 8-12, 1998: Port visit to Bahrain. August 16-17, 1998: Port visit to Bahrain. September 14-17, 1998: Port visit to Bahrain. October 7-9, 1998: Port visit to Bahrain. October 9, 1998: MILIUS departs the Arabian Gulf. October 22-27, 1998: Port visit to Darwin, Australia. October 31-November 5, 1998: Port visit to Mackay, Australia. November 14-17, 1998: Port visit to Pearl Harbor, Hawaii. November 23, 1998: MILIUS returns to San Diego. January 8, 1999: MILIUS enters the South West Marine shipyard in San Diego for post-deployment yard availability. March 16, 1999: MILIUS departs the shipyard. May 7-9, 1999: Anchored off Santa Barabara, California to take part in the Harbor Festival. August 6-8, 1999: MILIUS participates in the San Diego Harbor Pass and Review. Spends the weekend moored at Broadway Pier downtown and is toured by hundreds. October 29, 1999: CDR Tom Rowden relieves CDR McManamon as the ship's third Commanding Officer. November 12-15, 1999: Port visit to Mazatlan, Mexico. January 27-30, 2000: Port visit to Puerta Vallarta, Mexico. June 22, 2000: After another extensive training cycle, MILIUS departs San Diego for her second deployment. June 28-29, 2000: Brief port visit to Pearl Harbor, Hawaii. July 9-12, 2000: Port visit to Saipan, Commonwealth of Northern Marianas Islands (CNMI). July 18-22, 2000: Port visit to Hong Kong, China. July 27-31, 2000: Port visit to Singapore. August 10, 2000: MILIUS enters the Arabian Gulf. August 11-14, 2000: Port visit to Bahrain. August 29-31, 2000: Port visit to Abu Dhabi, United Arab Emirates. September 11-15, 2000: Port visit to Dubai, United Arab Emirates. The ship’s crest is designed in remembrance of the military service of the ship’s namesake, Captain Paul Lloyd Milius, and the courage and dedication that promoted his selfless act of heroism. Dark blue and gold are colors traditionally used by the Navy and denote the sea and excellence. The shield itself reflects the power of the Aegis shield. The double-edged battle-ax symbolizes the power of the modern guided missile destroyer. The battle-ax harnesses is a warning that peace should be maintained; provoked and unleashed, the battle-ax is a punishing offensive weapon capable of delivering crushing blows. The trident reflects the prowess of MILIUS, capable of projecting sea power on the land, in the air, and on and beneath the sea. The crossed swords are the modern Navy sword of today and the cutlass of the John Paul Jones ear symbolizing the enduring tradition and heritage of the United States Navy. The border, for unity, is red highlighting readiness for action and sacrifice, if necessary. The seven bolts on the border represent the seven lives saved by Captain Milius’ heroic action. The lion suggests Captain Milius’ extraordinary heroism as the aircraft commander in Observation Squadron Sixty-Seven for which he received the Navy Cross, represented by the cross plate, and underscored his selfless courage and inspiring devotion to duty.